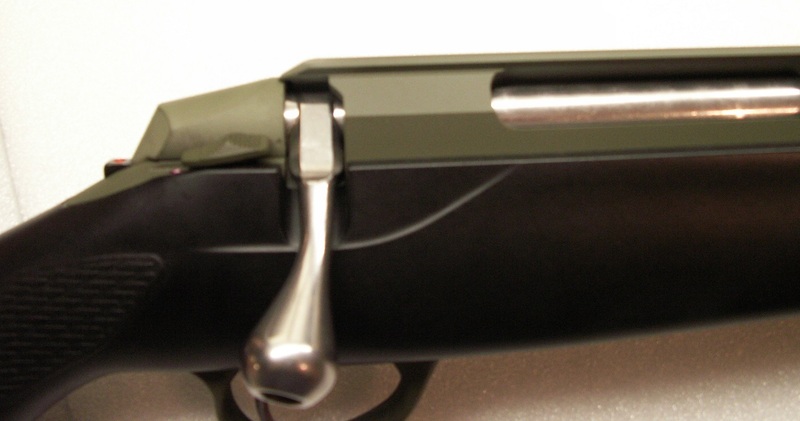 CerakoteTM H-Series Ceramic Firearm Coatings are designed to provide a high- quality, long-lasting finish for firearms and firearm accessories. CerakoteTM H-Series coatings are durable, corrosion-resistant and provide unparalleled levels of hardness and adhesion. The foundation for CerakoteTM H-Series coatings is a unique ceramic technology that imparts both flexibility and excellent wear resistance to the final coating. It’s about the best finish we have come across, just take a look at the Abrasion resistance here. These are the results carried out by a Taber Abrador – weighted abrasive wheels are rotated over the surface over a number of cycles, and the corisponding loss in thickness measured. 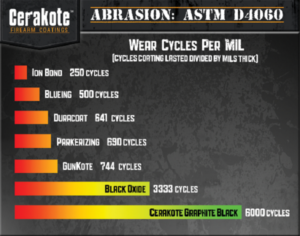 The results show, that to reduce the coating thickness by 1 mil (or 1 thou’ = 1 thousandth of an inch = 0.001″) some other coatings only last 250 cycles – CerakoteTM goes on for over 6000 cycles!